We welcome foreign students who want to study nursing in Ukraine at national medical universities. Ukraine know the importance of nursing subject and that is the reason of quality education in this field at national medical universities in Ukraine. All national medical universities in Ukraine which teach nursing program are recognized by WHO and that is the reason for recognition of Ukrainian nursing degree worldwide. Theory and practical training at nursing faculties in Ukraine is taught by high profile lecturers and practicals are held at modern hospitals. At nursing faculties in Ukraine many foreign students are admitted every year from every corner of the world. To be admitted at any national medical university in Ukraine international students must have secondary school certificate.Mostly students at Nursing faculties are studying from African region.Many come from Asian countries and they require 10+2 certificate to be admitted. Among all European countries Ukraine offers the best affordable fee for nursing course with quality education. Nursing is taught in Ukraine with both languages Russian and English but choice remain with the international students that which medium of instructions they choose for their nursing degree in Ukraine. There are countries where English is well spoken and understood and the nationals of these countries are good at English so they choose English medium of instructions for their whole nursing degree program. Many countries nationals do not understand English well so for the first year they study at preparatory faculty with science subjects and upon completion of their 10 Months Russian language preparatory course they join their nursing degree program in Russian medium of instructions. For example students from Nigeria,Ghana,India,Pakistan,Namibia,Zambia,Zimbabwe,Cameroon etc etc are very good at English so they study their nursing course in English medium of instructions directly. Students from Egypt,Morocco,Algeria,Palestine,Guinea,Angola,Ivory Coast etc etc study first year at preparatory faculty.This preparatory course consists of 10 Months. Nursing course is divided in two parts in Ukraine. It consists of 2 years and you become a nursing diploma holder from a WHO recognized medical university.After this diploma students may practice anywhere in the world. 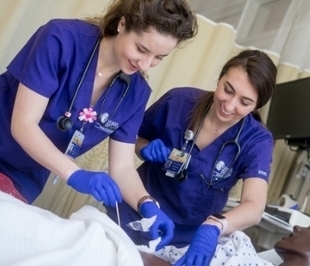 Its a full 4 years degree program in Nursing in English medium of instructions and you become a nursing graduate. After earning bachelor degree in nursing you qualify for admission in MSN program at any national medical university in Ukraine. All foreign students with secondary school certificates may apply for the admission into Nursing program in Ukraine. Students from Asian countries must have a 10+2 educational certificate for applying in Ukraine. International students who are interested to study nursing at national medical universities in Ukraine may scan their educational certificates with passport copy for their admission assessment. This assessment process in completed within 1-2 days and applicants are informed and than eligible students may send their admission charges. After receiving the admission fee their documents are sent to the Ministry of Education,Ukraine for the issuance of official study invitation.This invitation processing time is 2 weeks maximum.Original invitation is sent to the address of applicant for visa process. Ukraine has set up its national visa centers in many countries and international students obtain their visa without appearance at Embassy of Ukraine.They submit their visa application at visa center and collect their visas from there. Where there is not yet set up visa centers for Ukraine,Their nationals obtain their visas from directly from the Embassy of Ukraine. National visa centers information is provided once international student has official study invitation by Ministry of Education,Ukraine. Interested international applicants may contact us freely anytime for their 2019-2020 intake admission process in Ukraine.